Product #21383 | SKU 4365 | 0.0 (no ratings yet) Thanks for your rating! The 828mk3 from MOTU is a hybrid digital audio interface, that provides connectivity to any Mac or PC via FireWire or high-speed USB 2.0. The interface provides 10 channels of 192kHz analog recording and playback, combined with 16 channels of ADAT digital I/O and stereo S/PDIF. Equally suited for the studio and stage, the interface can function as a standalone mixer. Two front panel microphone/guitar inputs feature high-quality preamps, plus a V-Limit hardware limiter for overload protection. Additional protection is available via MOTU's Soft Clip function. 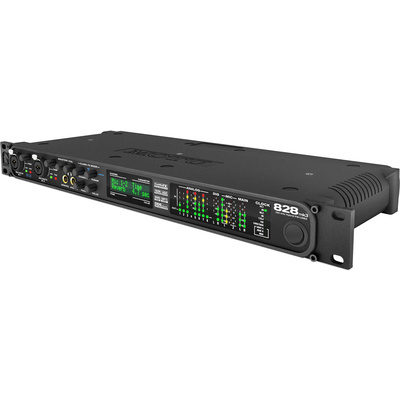 Each input is equipped with individually switchable 48V phantom power and a 20dB pad. Each microphone input has a rear panel send that allows for inserting outboard gear before the analog to digital conversion. Comprehensive connectivity means that any studio gear, including microphones, guitars, synthesizers, keyboards, drum machines, and even effects processors can be permanently connected. In turn, these can all be recorded, monitored, routed and processed using the professional on-board CueMix FX digital mixer, with no latency and no processor strain on the computer. The interface provides two FireWire Type B ports that operate at 400 Mbit/s. They can be connected to any available FireWire port on a computer, either Type A or Type B. If thecomputer has Type B ports, use the included 9-pin-to-9-pin FireWire cable. If the computer has either standard Type A ports or miniature Type A ports, use the appropriate 9-pin-to-6-pin or 9-pin-to-4-pin FireWire cable (sold separately).